Wheat Stax cereal, often just referred to as Stax cereal, was made up of flat, near-square pieces that resembled misshapen Honeycomb pieces with lots of nooks and crannies. Television ads for the cereal featured actors stacking pieces of Stax cereal. The cereal was referred to in ads as "the cereal for adults". One of the cereal's tag lines went something like, "Stax, the cereal that is toasted in places where other cereals don't have places!" Once you stop snacking and start eating you'll find there's more to STAX than stacking. New Wheat Stax really taste good. They're bite-sized chunks of toasted whole wheat. Cruncher because they're toasted on the bottom, top, sides - even inside. They're the toastiest, tastiest, crunchiest, stackiest cereal you've ever tasted. What do you think of Wheat Stax? Like many of the commenters below, I loved it as a kid, even though it was 'made for adults.' I was one of the oddball kids that didn't care if a cereal didn't have a lot of sugar in it, so naturally, I was very bummed when it was discontinued. I have forgiven them for no longer making Stax; but I won't buy anything else from General Mills. Wish I could still get this. This was great stuff! 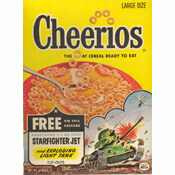 Take heed General Mills and bring it back! 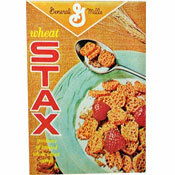 I remember eating Stax as a child; Only cereal I really liked!! I remember eating it at a lonely hotel my family stayed at on the east coast, in the 60s some time. I loved it. I had it other times too. Very fond memories of texture. Bring it back darn it! I am 61 now and still remember this as my favorite snack to eat one at a time. Absolutely my favorite cereal when I was a kid. Sad day when they stopped making it. OMG! I LOVED STAX. They gotta bring them back! For years, I've wondered why Stax disappeared from the market. It was instantly my favorite precisely because it wasn't sweet, and I think it would have a place in today's market.